Daily Illuminator: New Preorders On Warehouse 23: Puppies And Spring Break! March 3, 2016: New Preorders On Warehouse 23: Puppies And Spring Break! Winter isn't officially over yet, but we have a couple of preorders available now to help get you ready for Spring! Sun's out, guns out . . . guts out? Jump back into Spring with the slackers of Chez Geek, and take a road trip to the exotic locations like the Baja, while avoiding the perils of the Unexpected Blizzard. New, oversized event cards add rule changing effects! 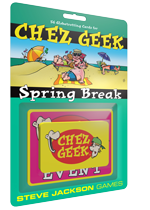 Nothing says Spring Break like a vacation, especially one with the Chez Geek crew. Now that the weather is warming up, it's the perfect time of year for walking a dog! And if you like dogs, you love puppies. And hey, if you don't like puppies, what kind of a monster are you? 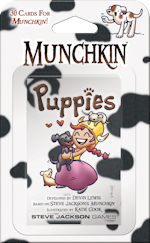 Katie Cook's art is absurdly adorable, but don't let their cuteness fool you, these puppies have a bite! You can preorder these games in time for Spring, from your Friendly Local Game Store, or from Warehouse 23, today!